This was the weekend of derbies in German football. Hamburg and Berlin were both buzzing with local rivalry while both Hannover, Kaiserslautern, Wolfsburg and Hoffenheim are all involved in regional derbies but no derby in Germany is more contentious or loaded with history than the Ruhr Derby between Dortmund and Schalke. The 133rd installation of this historic rivalry came under exciting circumstances. Dortmund is the in form team and early favorites for the league title. They recently lost their key playmaker Kagawa at the Asian Cup and everyone is eyeing them to see if the young team can combat the pressures and expectations. Schalke on the other hand, in particular coach Felix Magath, have come under heavy scrutiny for their recent transfers. Magath has been involved in 40 transfers since taking over last year and his most recent signings (Ali Karimi and Angelo Charisteas) are both labeled as over the hill and unsuited for the team’s progression. Schalke supporters have been very vocal in their criticism of Magath and have accused the club of losing its identity. First half – Dortmund dominated but fail to capitalize on chances. Dortmund came out blazing and could have been up by two goals in just the first 5 minutes if it wasn’t for Neuer being in the right place at the right time. Schalke had a hard time dealing with Dortmund’s high tempo pressing game. Götze and Grosskreutz ran the channels well while Sahin was supplying all the balls. Dortmund were moving like clockwork but Neuer had an answer for everything Klopp’s men threw at them. Annan, great at the World Cup with Ghana, had a hard time adjusting in his first Bundesliga game. Various midfielders have struggled to deal with Dortmund’s quick passing game, let alone a player on his debut. You cannot fault Annan’s performance considering it was his first for Schalke but it contributed to the overall disorder in Schalke’s midfield. That in turn allowed Dortmund to control the match and continuously run at Schalke’s backline. Dortmund’s interchanging attackers also constantly drew out Schalke’s fullbacks. In particular, Blaszczykowski gave Schalke left back Schmitz a horrid time and most of Dortmund’s attacks seemed to be concentrated on that side of the pitch. More on that later. 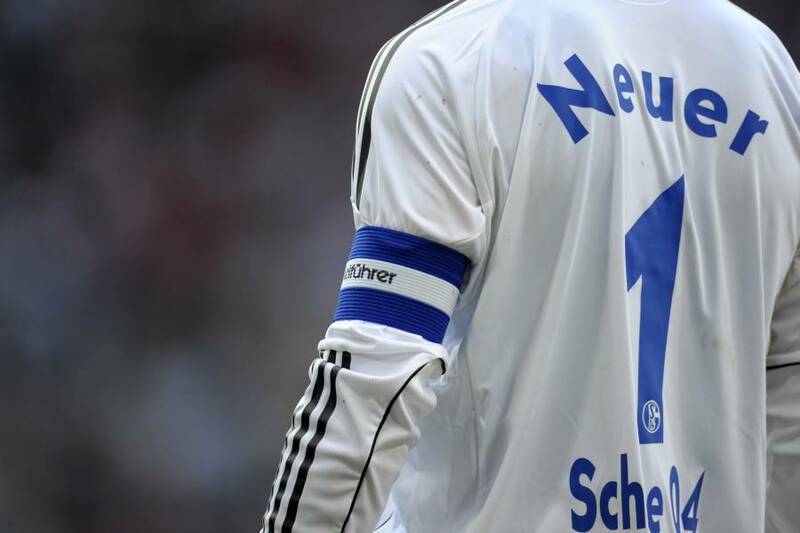 Neuer single handedly earned Schalke a point. Dortmund picked up right where they left off after the break. This time they tried taking their chances by shooting from outside the box with Piszczek and Bender hitting the target but not really troubling Neuer. It was going to take something special to beat Neuer and as much as Dortmund tried they were denied at every opportunity. His saves and the confidence he instills in his defenders kept Schalke in the game and allowed his team to gradually settle into the game as Dortmund grew seemingly frustrated. Schalke’s best chance came in the 76th minute when a through ball from Raul fed Jurado but was parried away by Weidenfeller. Neuer continued to deny Dortmund and made two successive saves after Schalke was caught on the counter. Götze could have won the game for Dortmund in the 84th minute after an incisive pass by Bender. Götze rounded Neuer but was only able to hit the post. Suffice to say, it was Neuer ‘s night as he essentially won this point for Schalke. He has been in fine form all season but his performance against Dortmund was one of the best in Europe this season. No other keeper saved more shots (9) in a single game in the league than Neuer. Schalke's game is more imbalanced than Dortmund's. In particular, the attacks are more focused on Farfan's side. Magath’s formations have varied the entire season. He has voiced his frustration with players like Farfan and Jurado on numerous occasions and these incongruities have a way of materializing themselves on the pitch. It is hard to pin down just what formation or system Magath tries to employ at Schalke. Part of that is due to Farfan and Jurado’s tactical discrepancies in the context of Magath’s sought after system. Farfan, despite his obvious talent and workrate, is a rather one dimensional and traditional winger while Jurado has yet to find his identity as a player in Germany. As pointed out earlier, most of Dortmund’s attacks came on the right, putting most of the brunt on Schalke left back Schmitz. Why was Blaszczykowski given so much space though? Part of the problem was Jurado’s positioning, which has been an area of concern for most of the season. 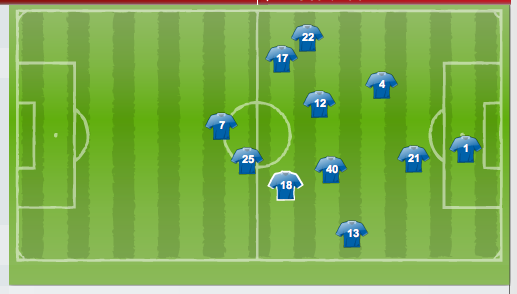 On paper, Schalke field a very straightforward 4-4-2 or 4-2-2-2 but when one looks at the actual movement and positioning it is extremely lop sided and that creates a host of problems. Average Schalke positioning, note #18 (highlighted player), Jurado, and how central he is. Because Jurado is not a natural wide player he tends to drift inside more than he should and it leaves the flank essentially exposed and as a result their left back vulnerable. Against Dortmund Schmitz had Blaszcykowski running at him all game because he had no defensive cover from Jurado, who was playing closer to his central midfielders than his fullback and strikers. Farfan’s instinct to hug the flank also creates disparity in Schalke’s attack. Many of Schalke’s balls are directed at Farfan and as a result their game can become repetitive and predictable. If Schalke are up against a team with a left sided midfielder who is more than willing to drop and defend Farfan will struggle. This was very much the case against Dortmund and explains why Grosskreutz, usually more advanced, played a bit deeper. It may also go a long way in explaining why, despite Farfan being an important player for Schalke, Magath was willing to sell him. Götze's ball distribution was key to Dortmund's attacking game. He was everywhere. It is hard to believe Mario Götze is only 18 years old. In his first professional season Götze has already established himself as one of the league’s better players and has, in the absence of Kagawa, effectively taken over the pivotal role of playmaker. Götze’s off the ball movement is crucial in doing that and he is at the heart of all Dortmund moves. Against Schalke, Götze was everywhere and linked up successfully with more players than anyone else. The prodigious playmaker was part of nearly all of Dortmund’s 21 goal chances and constantly brought other players into the game with his passing and movement. Many thought Dortmund’s game would suffer in the absence of Kagawa but Götze has filled in admirably and made most Dortmund supporters forget the Japanese playmaker was even absent. Both sides came into this match with the most clean sheets so a goalless draw is not exactly a huge surprise. Klopp and Magath have always emphasized defensive discipline and few sides are more well organized than these two. Dortmund may feel hard done by but the game could have gone into the morning and Neuer would have still kept everything out. It was that kind of night for them. Dortmund did play well however and it is encouraging that despite the absence of Kagawa, a drop in form from Barrios and a missing Subotic they still keep rolling on. Schalke on the other hand have bounced back after the unexpected loss against Hoffenheim last week and are looking to establish the consistent run of form that they went into the winter break with. The key will be Magath’s ability to structure the team well and integrate the large pool of players at his disposal. Excellent explanation of what transpired Friday in Dortmund. I was wondering why “Kuba’ had so much freedom down the right flank. And I think your assessment of the predictability of Schalke’s attack, focused so frequently on feeding the ball down the sidelines to Farfan, is limiting their success. I enjoy Farfan’s play a great deal and admire his workrate, but Schalke’s attack needs more variety.